As the flow of refugees and migrants continues into Europe, the report by Amnesty International (published in July 2015) provides sheds light on difficulties and hardship people experience in what’s called the Western Balkans route. 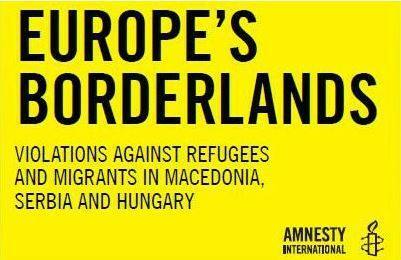 The report “Europe’s Borderlands – Violations against refugees and migrants in Macedonia, Serbia and Hungary” documents the constant risk of exploitation, arbitrary detention and ill-treatment many refugees and migrants face at the EU borders. Amnesty conducted interviews with asylum seekers and irregular migrants in Greece, Macedonia, Serbia and Hungary. The testimonies reveal that asylum seekers and refugees face exploitation, unlawful push-backs at borders, arbitrary and/or unlawful detention, ill-treatment by law enforcement officials and border police, but also lack of access to an effective asylum system and to legal aid. The Western Balkans route is unique because people leave the EU by exiting Greece to re-enter it after passing through Macedonia and Serbia, which are not part of the EU. The journey taken by refugees is often risky and dangerous. According to this report, at Macedonia’s border with Greece, and at Serbia’s border with Macedonia, refugees are routinely subjected to unlawful push-backs and ill-treatment by Border Police. They may be arbitrarily detained by the authorities. Moreover, their irregular status also makes them vulnerable to financial exploitation by law enforcement officers, who misuse their authority to demand bribes. The reception centre which raises one of the biggest concerns is Macedonia’s Reception Centre for Foreigners, also known as Gazi Baba (named after the Skopje municipality in which it is located). Amnesty International discovered that there is prolonged detention of hundreds of refugees and migrants, including families and unaccompanied children without any legal safeguards such as the right to challenge the lawfulness of detention, or any opportunity for refugees to claim asylum. Refugees are detained for irregular entry into the country, for the purposes of identification, or prior to deportation to Greece. Amnesty International is particularly concerned that refugees are detained because the authorities require them to remain in Macedonia as witnesses in proceedings against their alleged smugglers, while Macedonian law provides no legal basis for the detention of witnesses. The most illuminating part of the report are the transcripts from the interviews conducted with more than 100 refugees, asylum-seekers and migrants concerning inhumane conditions in detention centres in Serbia and Hungary, ill-treatment by police and boarder control officers and lack of access to legal aid. Amnesty International calls for safe and regular routes into Europe, and for the respect and protection of refugees’ and migrants’ rights. The last chapter contains recommendations for the EU as well as country-specific recommendations for Macedonia, Serbia and Hungary based on the findings documented in the report. Amnesty International encourages them to take action to change the current situation regarding reception conditions, access to asylum, border management and detention. ensure that any detentions for migration purposes are necessary and proportionate, and decided on an examination of individual circumstances, with all the procedures and safeguards set out in international standards, and prioritise the use of alternatives to detention.